Free Installation + Free Delivery + Free 10 feet pipe. Credit Card কাষ্টমারদের জন্য সর্বোচ্চ 6 – 36 মাস পর্যন্ত কিস্তি সুবিধা Description Gree GSH-18UG 1.5 ton U-poem wall mount split AC has 18000 BTU capacity, 1540 watt input capacity, multi fan speeds, wide angel AC louvers, comfortable sleeping mode, anti cool wind, turbo button, clock display, self diagnosis, washable air purify filters, memory function, lock, automatic operation system, remote control, inverter and on / off system, golden fin condenser, low voltage startup, low temperature startup, intelligent defrosting, drying operation, auto clean, LED control and soft start. 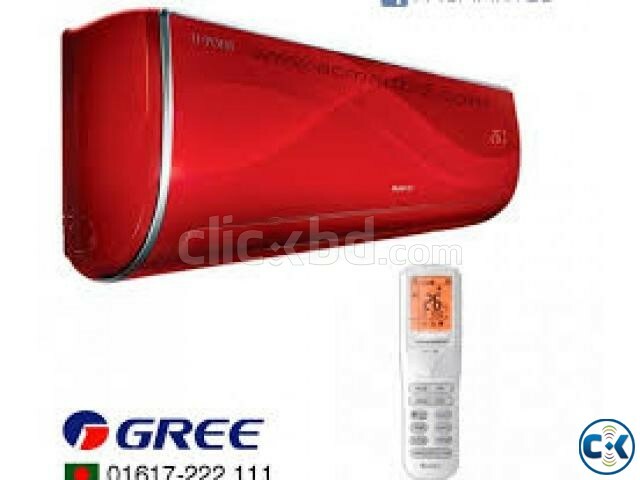 Product Feature AC Type Split AC BTU 18000 BTU Coverage 140-220 SFT Filter Type Auti Clean Fan Speed High speed Cool Speed Up To 4 Speed with Turbo Function Air Control Auto Remote Control Yes Timer Yes Temperature Adjustment Yes Product Warranty This product gree gsh-18ug air conditioner comes with 3 years compressor replacement guarantee , 1 year service, 1 year spare part.